I was preparing dinner before the climb while reminiscing about the visit Dominik and I paid to the Wafer Thin Fin four years ago: how we got lost on the way and couldn’t complete the climb. Classic untold tale. Reminiscing of course brings nostalgia, a known fact. That’s perhaps why Jacques Brel was playing on my stereo (is stereo the right word these days for streaming music over bluetooth from a phone to a wireless speaker?). Massaging that organic grain-fed chicken with cold pressed olive oil, the sound of that harrowing accordion on Jaurès had never been so powerful. So, yes, reminiscence. 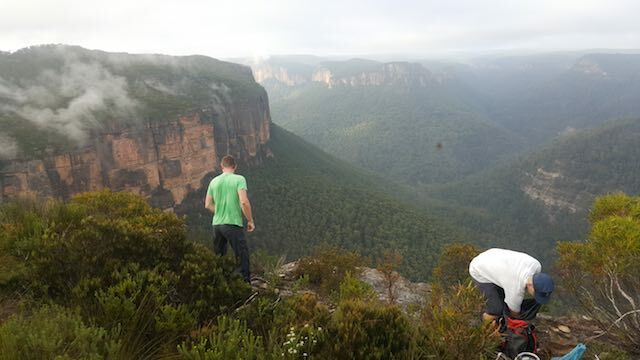 Four years ago after too many hours of bushbashing, Dominik and I – already exhausted – were standing at the top of Dalpura Wall looking down at the Fin. 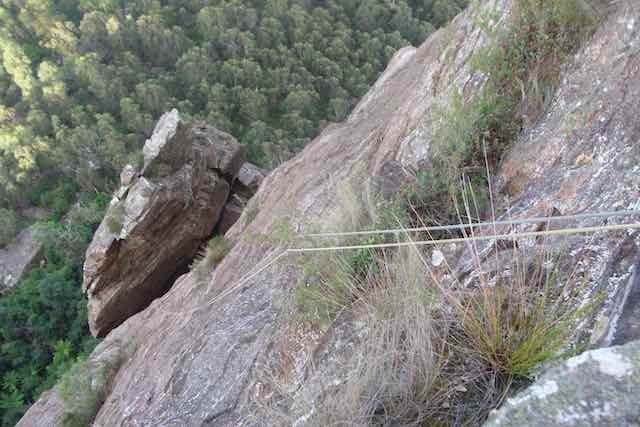 By the time we completed the two required abseils to get to the bottom, I was convinced we didn’t have enough time to complete the climb. So, we reverently touched theFin, bade it farewell (aufwiedersehen I heard Dominik mumbled), and climbed back out following Welsh Dragon. Naturally, we got lost on the way back to the car too and – while Brel was singing Les ramparts de Varsovie – I had to admit to myself that I had seldom been so tired in my life. Next to the bowl of macerated strawberries I intended to serve with whipped cream to recreate my mother’s memorable strawberry shortcake recipe, was a printout of Dalpura Wall topo: plan you dive and dive your plan is as good an advice to rock climber as it is to ocean divers. Jos and Liam had guaranteed that they could take me and Dominik to Dalpura Wall in less than one hour from the car park. Now, if we could read that topo competently and start early enough on the next day, things should be hunky-dory (who says hunky-dory anymore? Gee, get with the program). For those who have no idea about the Fin here’s a picture of it from the top of Dalpura Wall. 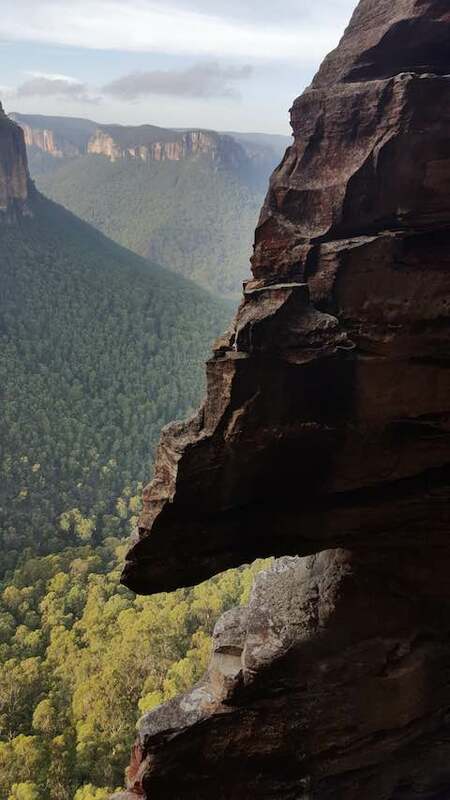 View of Wafer Thin Fin pinnacle from the top of Dalpura Wall. On a geological timescale that thing is f---ed. It's a giant middle finger from mother nature to gravity. It’s an insult to geology and a big FU to the second law of thermodynamics. In fact, I strongly suspect that a strategically placed ants nest would collapse that incongruous pile of half-rotten, half-baked friable rock. How the various flakes tenuously hold together is beyond material science and if the multiverse theory is valid, then that construct exists in only one of the infinity of universes: ours. And surely only temporarily at that. That being said, it is as majestic as it is improbable. 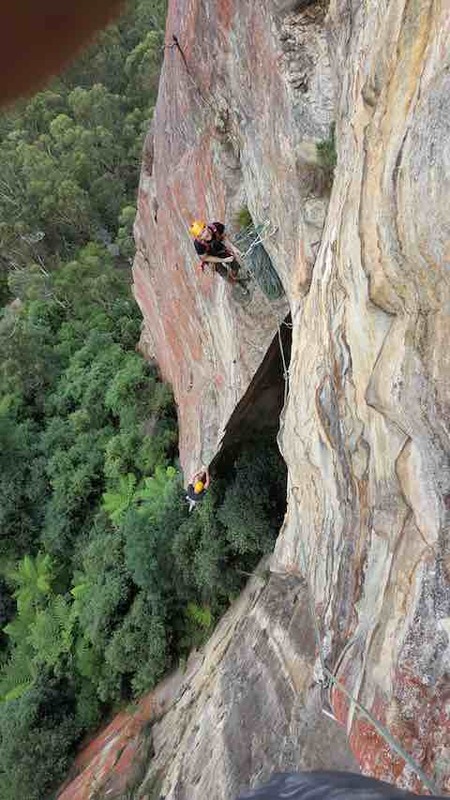 Abseiling between the Fin and the main wall is rediscovering the thrill of abseil. It’s filling up with childlike pleasure as you run your fingers against the Fin while descending into the narrow gap. On that early Sunday morning, the four of us experience the perfect conditions: a warm windless, sunny day in the shade. It was mid-morning and we were ready to climb. Liam just after traversing to the real beginning of pitch one. The pump starts here. Overall this pitch is rather pumpy and by far the longest (35m, 21). Two sections are noteworthy. 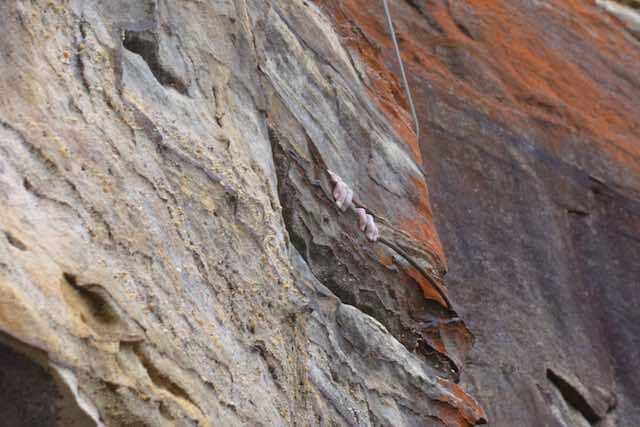 First, about half way up, a rather technical section where the climbing moves from the arête itself to the face: you’ll need some reach for that one. Then, five meters from the top, a scary assembly of flakes that flex as you pull on them. Go and do the Fin now 'cos those flakes won’t last long. Yes, there’s a guy on the other side. That’d be Liam. 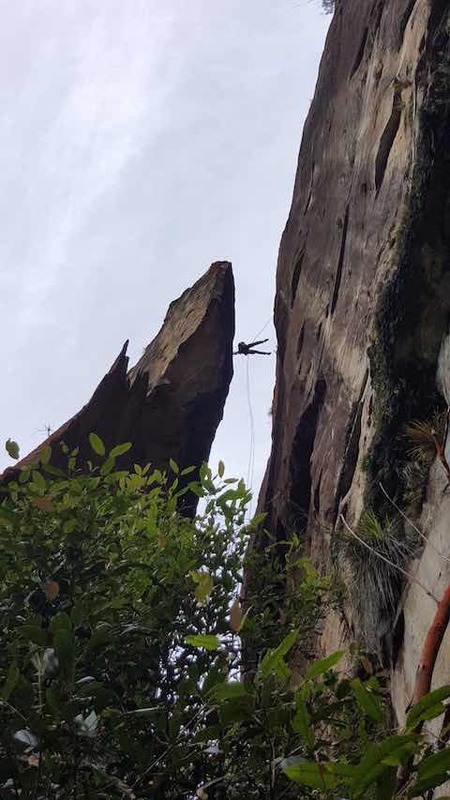 Jos was leading that second pitch and was able to take this picture of both myself on pitch one and of his belayer Liam. Myself down below starting pitch one. Liam waiting for Dominik and I to top out. Life has been harsher. Later on that night, when everyone but Dominik had gone home, I fell asleep with Brel’s voice covering the delicate piano work of Voir un ami pleurer. Truly, Les marquises was and remains a stupendous album. And what a great day it was. The facts: Car to car 12 hours; 1 hour walk in; 170 meters; 7 pitches; max grade 23; a single team would comfortably shave off 2 hours; a strong team could probably do the whole thing in 6 hours. Top notch reporting! Thanks for the giggles. So what did Jos score for getting you there in the hour? Do I detect a note of fatalism here? Brel's beautiful last album (number '13' no less)... Proust's interminable, posthumously published 7-parter...? Is the 'wafer thin fin' a metaphor, perhaps? For the imperceptible (even 'infrathin') line between life and death? Between triumph and tragedy? Between the ever-passing present and the 'lost time' for which we hopelessly search? An excellent trip report, as always, marred only by the fact that you didn't invite me along. Another classic f_ladou trip report. Very funny, yet accurate and reflective. If only Brel could read it! Even drunk, you nailed it Lingy. That trip report was indeed more about some Proustian mal de vivre than about climbing. I'll shake it off when we do it again with the other Alex in spring. Can't wait. >when we do it again with the other Alex in spring. Can't wait. Love your work - awesome reminiscence - and a big motivator to get back to the grose (for some easier choss). By sheer chance, I met Neil Monteith last weekend at Bardens Lookout. For those who do no know, Neil set up Wafer Thin Fin amongst many, many others. 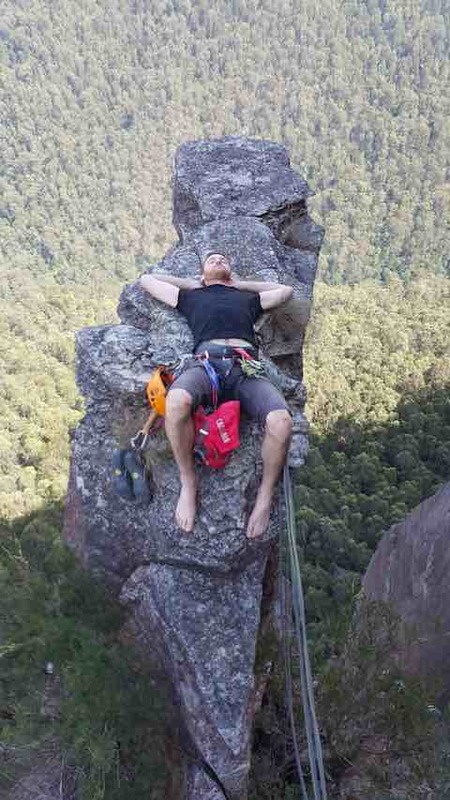 I told him that I repeated the route the weekend before. That brought a wide smile to his face and he said that he never heard of a repeat since he dragged Mike Law a few years back to do it soon after bolting it. Well, looking at The Crag (theocrat.com), I can tell that a handful of people repeated the route over the last years. So, all this bolting is worthwhile Neil! Also, here are a couple of more pics from our epic ascent. The boys getting ready for the abseil. The knife blade edge of the Fin’s second pitch. 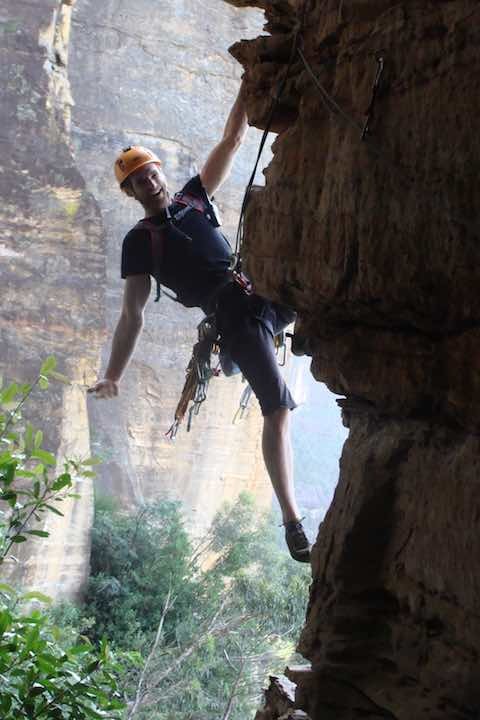 Jos abseiling between the Fin and the main wall.